Yesterday in our first day of coverage from CEATEC 2017 we said that the main focus of the expo had shifted from the development of just normal electronic appliances to a new kind of services, not just on the technological level (example: 8K TVs), but also those surrounding us in our environment. These technologies focused on assisting people in where they live and affecting how they live (example: what and how we eat), to reshape and redefine the whole of society in all its aspects. So today we are going to focus our attention on the biggest innovations in this field that we have seen at the show. Absolutely the most innovative thing we've seen on the second day, this piece of tech is placed inside our mirrors at home and can detect all our big data in real time. For example: our vascular age, the stress level (at the moment we press the button! ), heart beat per minute etc - and it shows all this data on the same mirror we look at, and in just a few seconds! See it in operation with our own eyes. Asahi Kasei's "Connected Home Solution" line up is also impressive and the company is going to deliver a huge innovation in the same direction as Fujitsu. The 'VitalBit' technology (similar to Fujitsu's sensor in that it can detect all our life data, but also show our pulse wave on the mirror too), plus through combined use with the 'Voice Technology', 'Skelton', and the 'Human Sensing' technologies, can transform the home where we live in a "living thing" that can sense (through its IR sensors and signal processing ICs ) where we are, when we or other people are moving or not, going in and out, take trace of it, recognise it, and then make a real intelligent "Smart Home" that is at our service. With an smart house like this, we will not need keys or lock any door behind us, because the house will recognise us on its own and permit us. Something very similar to what we have seen in Back to the Future: Part II when Marty McFly Jr. comes back home. And it is not in a so distant future! Also with the 'Co2 Sensing' technology AKM can regulate on its own the demand for air-conditioning and, because of highly air-tight build, insulate the building, thereby saving energy. If you want to learn more of this incredible Japanese company that historically used to be known as a chemical company then head on over to its official website now. This is a pliable patch device that evolved from the old integrated circuit where chips used to be soldered into ICs that can be added onto clothes, making technology part of our life, even when on the move and without any worry of losing them while walking or running (as used to be until now with smart phones and/or notebooks). Combined with this, the other real big innovation from the Matsushita Corporation (Panasonic is only a part of it), is the new 'Smart Ageing Care System' that pushes forward the surveillance of the single person 24/7 on each aspect of their life (even how many minutes they stay in the WC). This to insure a timing and surveillance that leaves no room for human error, helping to preserve life and prevent accidents. Also shown off in this booth is a 'Physical Condition Sensing' detector, which calculates in real time our skin temperature, drowsiness level, heat loss, valence, pulse, thermal sensation and more. Amazingly, it does this without touching anything. Clearly at the moment the smart ageing care systems will be largely limited to hospital use, but we are pretty sure that with continued investment and research very soon we will see them popping up in residential homes. Plus having tested some of these technologies at CEATEC 2017 we also fee they could rapidly become the new Arduino, due especially to its versatile daily use, in every aspect of our life - communicating our position in the city, opening doors without keys, turning on lights or water when we pass etc. This wearable technology reminds me of the Internet phenomenon at the beginning of the 1990s, when nobody foresaw the type of connected, always on society that we are living in right now. Another prototype that surprised all the people here at the CEATEC 2017 is the calorie-counting device named 'Calo Rieco', that tells us in real time the calories, fats, and proteins of each food we put inside the machine, and which, with its unique near-infrared exclusive analytical technology, displays each detail in just a few seconds. Plus, 'Calo Rieco' after having checked every single detail of what we want to eat (or we have already eaten!) tells us what to add, and what to avoid for our daily balanced diet. Just be sure that this diabolic thing does not fall in your partner's hands if they are anyway inclined towards dieting, as otherwise your culinary life at home may suddenly take a turn for the less tasty. 100 per cent guaranteed! Remaining in the medical field, quite for sure - having witnessed yesterday the evolution of the drone with two real arms - KDDI once again impresses with its new 'Telesar V' motion-copying robot. Imagine what this virtual worker can do at our place in the upcoming years (the first are planned to be on the market by the 2023) or in dangerous environments like caves or mountains. 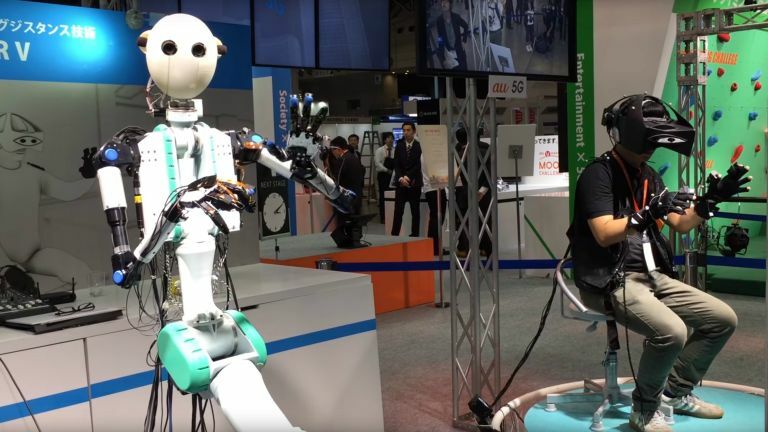 Another innovation presented here at the show is Hitachi's robot for Dementia Patients. And in the same line there is Qoobo's android for the pet therapy. Moving onto some flamboyant new ideas seen today the show, the first thing that comes to my mind is the VR version of 'Wind Surfing' made by Fujitsu. Sincerely here on T3 during these years of hype for this technology we have seen every kind of VR set, but this one seems a cut above most and is a lot of fun. In the end it is clear that here the whole industry is going to reshape and control through cloud technology everything that surrounds us. Our house, car, phone and our material body, everything will be soon be under the control of a remote sensor. At the same time the human error, fatal in many reported cases in hospitals, will become hopefully rarer and rarer. All these innovations are powered by the cloud are the pivotal centre of a new technological revolution, that like it or not will change the way in which we live. Big data is the key, and the cloud is the instrument to achieve it. See you tomorrow for Day 3 of T3's CEATEC 2017 coverage.